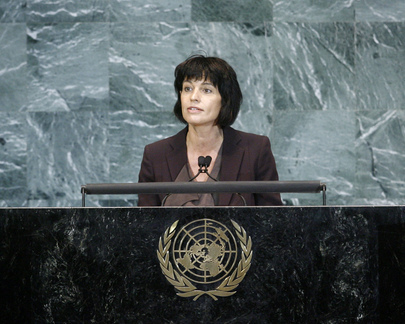 DORIS LEUTHARD, President of Switzerland, said the ongoing renovation of the United Nations building prompted her to ask what kind of Organization was being built for the next 10, 20 or 30 years. “We need a UN that can make an effective contribution to solving the world’s problems,” she said, with Member States ready to take on that responsibility. The Organization’s future must reflect the world of tomorrow, and, thanks to new developments in technology and information, people would participate more directly in the challenges facing societies. They will also demand that the United Nations be accountable to them. In an increasingly globalized world, the principles in the United Nations Charter must be treasured. Solidarity meant more than providing assistance to countries when they were unable to help their own citizens; it meant reminding States of their duties towards their own people in terms of security, the rule of law, human rights and democracy. In that work, States must place their national interests second to the common good. The search for sustainable solutions to the global economic crisis, climate change, security and development must reflect the world’s new realities, she continued, with States whose economic success enabled them to play a more active role in world governance accepting that new duty. As for the United Nations, its legitimacy depended on its ability to respond to the expectations placed upon it, and at times, it appeared ill-equipped. Debates must lead to action and results in the interest of the common good. Failure in that regard would mean other groups, representing only some of the world’s countries, would step in. Such groups lacked legitimacy and it was crucial for the Organization to remain at the centre of world governance. Concerted global action was required in several areas, she said, stressing first that the Millennium Development Goals must be fully implemented. “Dropping sacks of rice from helicopters is not enough,” she said. Further, binding objectives must be defined as quickly as possible for reducing carbon dioxide emissions. Clean technology was available and every nation must act with targeted measures. Waiting for the industrialized countries to invest in the South would not lead anywhere. Switzerland would reduce its greenhouse gas emissions by 20 per cent by 2020. In other areas, she said 30 years after the end of the cold war, the proliferation of weapons of mass destruction remained a grave threat, but the gravest harm among civilians was caused by small arms and light weapons, and terrorists benefited from that situation by supplying themselves in the arms market. Switzerland, among others, supported the full implementation of the United Nations global anti-terrorist strategy. Gender equality also must become a priority, as it was high time to make full use of their potential in mediation and reconstruction efforts. She closed by saying “we must avoid making the United Nations an immutable historic monument”, but rather turn it into a dynamic Organization. To do that, every State must put its own house in order and commit itself clearly, within the Organization, to respond to the urgent questions facing the world.